Coldwell Banker International Business Conference in Orlando, Florida. Real estate agents armed with Sprint Palm® CentroTM smartphones learned how to stay connected to the resources, information, and people they need at every stage of the deal, thanks to Palm, Inc. Utilize Centro's latest productivity enhancing real estate applications like GE Supra eKey, which allows agents to open and program their own iBoxesTM and Mortgage Calc, which allows agents to calculate complex mortgage payments, including mortgage insurance, estimated property tax and home insurance. Connect to your laptop for accessing the Internet from the road at broadband-like speeds. Includes Google Maps for Mobile application - for turn by turn directions and location searches. Capture pictures or live video and send them to your broker or clients over the air. In the Advanced Session, agents will learn how to stay connected to the resources, information and people they need at every stage of the deal with the Sprint Palm Centro smartphone. They will be shown how to enhance the Centro to gain a competitive edge, attract clients, gain listings, and speed valuable closings. 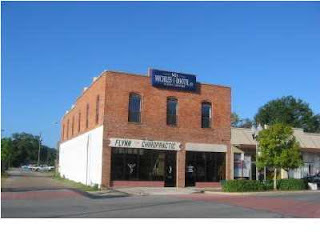 I think it's pretty cool that the Centro can be used as such an important tool by real estate agents. 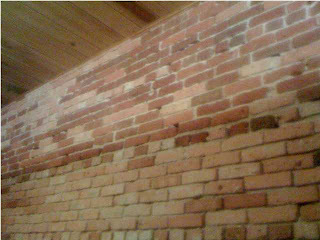 If I was a real estate agent, I'd be happy to use my Palm smartphone as a helpful tool. Continuing to blaze a path of innovation in the real estate industry, Coldwell Banker Real Estate LLC today became the first full-service national real estate brand to launch a customized online platform for iPhoneTM users. The Coldwell Banker flagship Web site, coldwellbanker.com, now has a different look and feel, along with navigation specifically tailored for optimal viewing on the iPhone, most notably with the property listings search and home value estimator functions. 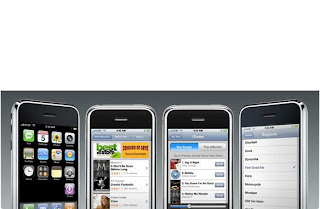 When a user accesses the site through his or her handset, the Coldwell Banker Web site automatically recognizes that it is being accessed by an iPhone, and will serve up the special iPhone interface. iPhone users do not need to download any special software to benefit from this enhancement to the Coldwell Banker mobile technology. "Providing easy access to real-time real estate information is critical for consumers in the home buying and selling process," said Michael Fischer, senior vice president of marketing for Coldwell Banker Real Estate LLC. "Distribution of listings is crucial in today's environment. Our mobile society is moving away from the desktop and utilizing cell phones and PDAs for more and more content and entertainment. With so many connecting to the Web by phone, we have to be where the consumer is in a way that makes sense." 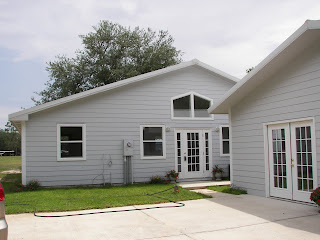 Those looking for a home will be able to search for homes and utilize the brand's home value estimator. In addition, consumers will be able to enter specific search criteria such as city, state, price as well as optional filters including number of bedrooms and bathrooms. When a property is selected, iPhone users can view all of the specifications for that home and contact an agent directly. "Now more than ever consumers want to access information about a home as they see it, pass it or hear about," continued Fischer. "Being in front of a computer should not be mandatory." Earlier this year Coldwell Banker became the first national real estate brand to put its listings on in-car GPS devices through an exclusive feed to Dash Navigation. Drivers can now call up Coldwell Banker listings, map them, get directions and view other Coldwell Banker listings in close proximity. iPhone is a registered trademark of Apple Computers, Inc.
Blackwater Heritage State TrailBlackwater Heritage State Trail is officially designated as part of Florida's Statewide System of Greenways and Trails. This is the westernmost rail trail in the state, extending from the small community of Milton in the south to Whiting Field Naval Air Station (NAS) in the north. Managed by the Florida Park Service, it also connects to the Military Trail (also identified on map) which is managed by the US Navy. It's hard to tell where one ends and the other begins. It's mostly a rural trail with only a few dwellings at some of the cross roads once you leave Milton and before you get on the military base. There are some nice creek crossings on wooden bridges with few hills or grades. This is a pleasant trip for the whole family with lots of access and safe riding. Click here for the trail brochure (PDF 405 kb). Trail Length/Surface: Blackwater Heritage is 7.0 miles, non-motorized paved (asphalt 12' wide); Military is 2.2 miles, non-motorized paved trail (asphalt 12' wide); equestrian unpaved trail parallels a portion of the paved trail. Notes: The Milton Trailhead contains a covered picnic shelter, restrooms, a water fountain, and a bicycle rack. 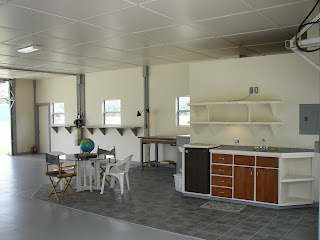 There is a visitor center approximately one mile from the trailhead that offers two picnic tables and parking. The Blackwater Heritage State Trail Citizen Support Organization operates a concession at the visitor center where snacks and souvenirs can be purchased. Benches have been located at various points along the trail for visitor convenience. The equestrian portion of the trail travels adjacent to a segment of the paved trail with shared bridges. 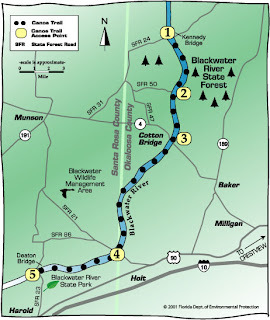 The equestrian trail itself begins about one mile north of the Milton Trailhead, but equestrian access is available at the parking area located at Munson Highway (see parking location identified on map). 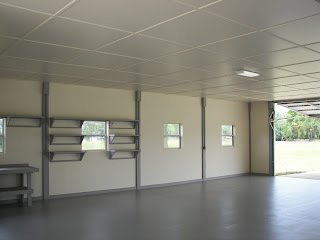 There is ample oversized parking available, as well as a newly constructed picnic shelter. When you travel north of the Visitors Center, bring plenty of water with you because there are no facilities for potable water available. Milton Trailhead From I-10 West (coming from Crestview), take Exit 31 (old Exit 10) to SR 87. Follow SR 87 to the intersection with US 90. Take a left (heading west) on US 90. Follow US 90 into Milton to the intersection where SR 87 heads north (to the right). Trailhead is located at this intersection. From I-10 East (coming from Pensacola), take Exit 26 (old Exit 8) to SR 191. Follow SR 191 through Bagdad into Milton and turn left on US 90. Trailhead is located at the intersection of US 90 and SR 87. Munson Highway Parking Area Follow directions above to Milton. In Milton, proceed to intersection of US 98 and SR 191. Proceed north on SR 191 (Munson Highway) to intersection with trail and parking area. Florida Real Estate with Brandon Jordan, your Northwest Florida Realtor serving Crestview, Eglin Air Force Base and Duke Field, and ActiveRain featured Realtor for Okaloosa County since 2007. We provide this information and much more on our site for you at no charge, so please remember us when you're looking to buy or sell real estate. The Blackwater River Canoe Trail is officially designated as part of Florida's Statewide System of Greenways and Trails. Located in the middle of Florida's Western Highlands, this 31-mile canoe trail flows through the Blackwater River State Forest. Cedar, maple, and cypress trees often form a dense canopy over the river. There are also some high bluffs where pine and cedar trees tower above the paddler. The water is a dark, tannin-stained color. 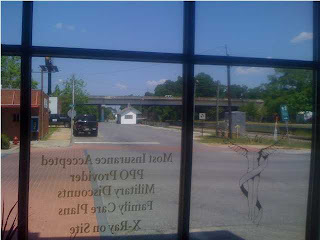 The Creek Indians called the river "Oka Lusa" (water-black). Along the bends, white sandbars provide a perfect place for camping or picnicking. The trail provides opportunity to observe wildlife including deer, turkey and bobcat. The Mississippi Kite soars overhead in the summer. Fishing can be an enjoyable addition to the trip. This panhandle trail ends at the Deaton Bridge, in Blackwater River State Park. ** Please note that the river is non-navigable beyond Deaton Bridge at the State Park. Click here to download printer-friendly map and description (388 kb PDF). The river level fluctuates rapidly following heavy local rains. Check local weather conditions before beginning your trip. The upper part of the river is fairly swift-flowing and requires some paddling experience. Kennedy Bridge - Take Hwy 90 from Crestview to SR 4. Take SR 4 north to State Forest Road (SFR) 47, the first paved road past Cotton Bridge. Turn right on SFR 47 and head north to the next paved road, SFR 31. Follow SFR 31 about 2 miles north to SFR 24, the dirt road at Hurricane Lake sign. Follow SFR 24 to the bridge. There may be access points (both public and private) in addition to those listed here. Please remember that some sites require a fee for launching and /or parking. 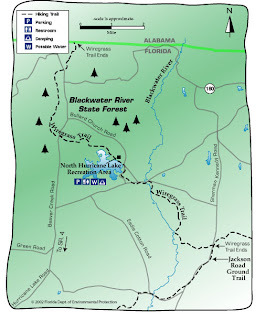 The Blackwater River State Forest offers a natural retreat set amidst the beautiful rolling hills of northwest Florida. Reaching from Conecuh National Forest along the Alabama border toward Eglin Air Force Base, this state forest is Florida's largest at nearly 190,000 acres. The forest is characterized by its many streams, including the namesake Blackwater River, that flow gently south as they make their way to the Gulf of Mexico. Certified as a segment of the Florida National Scenic Trail, the Jackson Red Ground Trail retraces one of the earliest trade routes of Indians and settlers in Florida. Also, be sure to visit the Sweetwater, Bear Lake and Jackson Trails. 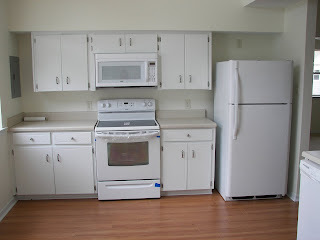 Fee: Fees apply in some areas. Please contact the Division of Forestry for details. Notes:Jackson Red Ground Trail is blazed orange, and is a segment of the Florida National Scenic Trail. The Florida Trail Association (FTA) produces a detailed hiking guide and segment-by-segment maps which are very useful for hiking the Florida National Scenic Trail. 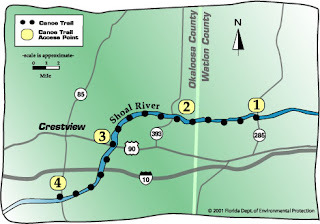 For more information, visit FTA's website at http://www.florida-trail.org/index.htm or call 1-877-HIKEFLA.Three connecting trails are also shown on the map (Sweetwater, Bear Lake and the Wiregrass trail south of Hurricane Lake) are part of the Florida Division of Forestry's Trailwalker Program. This program offers recognition awards for hiking designated trails in state forests throughout Florida. For more information, contact the office below or visit the program's website (www.fl-dof.com/Recreation/Trailwalker/index.html). Access/Directions:Red Rock Road Area (main access for Jackson Red Ground Trail)From I-10, take the Avalon Boulevard Exit (Exit 22). 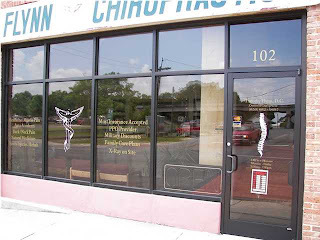 Follow Avalon Boulevard to US 90. Take a right and continue to Burger King. Take a left at Stuart Street (Hwy 87). Go to Milton High School. 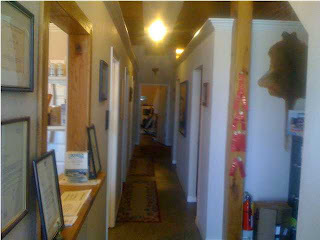 Take a right across from Milton High School onto Hwy 191. Follow Hwy 191 north to Red Rock Road at Spring Hill. Take a right on Red Rock Road and proceed to the Red Rock Primitive Area/Canoe Launch. Trail crosses Red Rock Road .3 miles to the east. The south end of Jackson Red Ground Trail begins at the road crossing -- proceed north to enter this portion of the trail. The trail segment south of this crossing is the Juniper Creek Trail. Krul Recreation Area (main access for Sweetwater Trail)From I-10, take the Avalon Boulevard Exit (Exit 22). Follow Avalon Boulevard to US 90. Take a right and continue to Burger King. Take a left at Stuart Street (Hwy 87). Go to Milton High School. Take a right across from Milton High School on Hwy 191. Follow for approximately 20 miles to the Munson crossroads (Hwy 191 and SR 4). Take a right on SR 4 and continue for .7 miles to the Krul Recreation Area sign. Go to kiosk at day use parking lot. Shoal River Canoe TrailThe Shoal River Canoe Trail is officially designated as part of Florida's Statewide System of Greenways and Trails. Twisting and turning through a remote part of the western Panhandle, the Shoal River trail covers 27 miles. Few indications of civilization are evident as you paddle through forests of maple, oak, gum, and cypress. Along the trail, creeks broaden into small lily-covered pools that provide excellent fishing. Sandbars along the bends of the river make good campsites. This narrow river is usually 3-4 feet deep, and water levels do not generally fluctuate more than 3 feet. Click here for printer-friendly map and description (PDF 393 kb). Notes and Precautions Between Access 1 and 2, there are two wooden bridges that collect debris which can be dangerous, especially at high water. The end of the trail is on the northern boundary of the Eglin Air Force Base Reservation. Obtain a base recreation permit if you plan to enter the reservation. 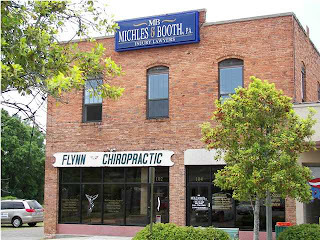 Information about permits can be obtained by calling (850) 882-4164 or writing Eglin National Resources, 107 Highway 85 North, Niceville, FL 32578. You can continue seven miles past the takeout at SR 85 to the junction with the Yellow River, another state canoe trail. There may be access points (both public and private) in addition to those listed here. Please remember that some sites require a fee for launching and/or parking. The Blackwater River State Forest offers a natural retreat set amidst the beautiful rolling hills of northwest Florida. Reaching from Conecuh National Forest along the Alabama border toward Eglin Air Force Base, this state forest is Florida's largest at nearly 190,000 acres. The forest is characterized by its many streams, including the namesake Blackwater River, that flow gently south as they make their way to the Gulf of Mexico. Located in the northern extent of the state forest, the Wiregrass Trail is certified as a segment of the Florida National Scenic Trail and a portion is included in the Division of Forestry's Trailwalker Program. Among its highlights, the trail takes hikers through part of one of the largest remaining stands of longleaf pine/wiregrass natural community found anywhere. The hiking trail is blazed orange. Heading northwest from the North Hurricane Lake Recreation Area, the trail is 6.4 miles to the terminus at the Alabama border. 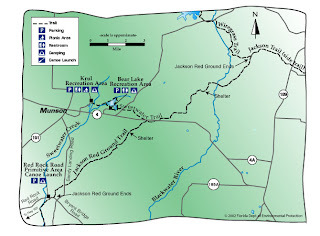 Heading southeast, it is 6.3 miles to the Jackson Red Ground Trail, which is a continuation of the Florida National Scenic Trail. 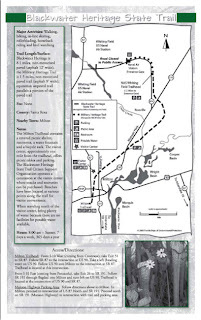 The Florida Trail Association (FTA) produces a detailed hiking guide and segment-by-segment maps which are very useful for hiking the Florida National Scenic Trail. For more information, visit FTA's website at http://www.florida-trail.org/ or call 1-877-HIKEFLA. The 6.3 mile segment from Hurricane Lake to Jackson Red Ground Trail is part of the Division of Forestry's Trailwalker Program. This program offers recognition awards for hiking designated trails in state forests throughout Florida. For more information, contact the office below or visit the program's website (www.fl-dof.com/Recreation/Trailwalker/index.html) . From Munson, head east on SR 4 2.8 miles to Hurricane Lake Road. Turn left onto Hurricane Lake Road (which eventually becomes Beaver Creek Road) and continue north 8.6 miles to Bullard Church Road. Turn right and continue 1.1 miles to Nichols Road. Take a right and continue to the recreation area. Go to the kiosk in the campground. From Crestview, head west on US 90 to the intersection with SR 4. Take a right on SR 4 and follow to Hurricane Lake Road. Turn right onto Hurricane Lake Road (which eventually becomes Beaver Creek Road) and continue north 8.6 miles to Bullard Church Road. Turn right and continue 1.1 miles to Nichols Road. Take a right and continue to the recreation area. Go to the kiosk in the campground. If coming from I-10, take the Avalon Boulevard Exit (Exit 22). Follow Avalon Boulevard to US 90. Take a right and continue to Burger King. Take a left at Stuart Street (Hwy 87). Go to Milton High School. 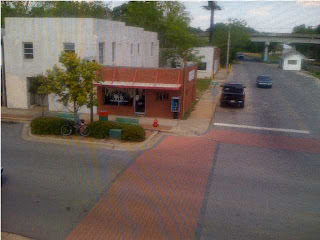 Take a right across from Milton High School on Hwy 191. Follow for approximately 20 miles to Munson crossroads (Hwy 191 and SR 4). Follow directions from Munson above. 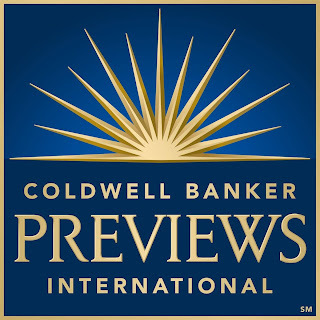 Beginning May 15th, 2008, Coldwell Banker Real Estate LLC, the 2007 Inman News' Innovator of the Year winner in the brokerage/franchise category, became the first national full-service real estate company to distribute its listings to a GPS device. Coldwell Banker worked with Dash Navigation Inc., the first GPS provider to have an Internet connected GPS device and deliver Web-based content directly to the GPS.Just as Coldwell Banker now feeds listings to such Web sites as Google, Yahoo, Trulia and others, brand listings from around the U.S. will now be fed to DASH users by accepting the Coldwell Banker feed via their "myDash" personalized Web site. Listings then automatically load on their Dash navigation device. "We have been waiting for the day to deliver our listings to GPS users and are thrilled that the Dash Express has finally opened that door to us," said Michael Fischer, senior vice president of marketing for Coldwell Banker Real Estate LLC. "Our relationship with Dash is a natural progression in our effort to have consumers engage with Coldwell Banker at every turn so that when the time comes to enter the market they are apt to collaborate with a Coldwell Banker sales associate. "The Coldwell Banker feed, now exclusive to Dash, allows consumers to call up Coldwell Banker listings, map them, get directions and view other Coldwell Banker listings in close proximity.